Alice and her counterparts are facilitating the Girl's Empowerment in Technology project. 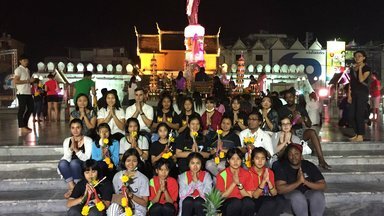 The Girl’s Empowerment Technology Project 2018 is a multi-phase plan aimed to expose Thai youth and local teachers from communities across Thailand to computer science in a way that is fun, creative and inspiring. This project will ultimately culminate in a 3 day/3 night Girls Empowerment camp/training experience. Forty-two girls aged 12-13, twenty Thai counterparts and teachers, and about five Peace Corps Volunteers will be drawn from communities throughout Thailand. The other participants will come from schools around my community. Students from the University will assist with the camp. In order for these students to be prepared for the camp there will be a training beforehand which will be completely covered. Each day of the camp will consist of activities, lessons and games dedicated to developing youth leadership, gender equality, problem solving, critical thinking, planning and the importance of persevering through challenges. Planned sessions will include technical instruction using Scratch 2.0 computer programming language, development of life skills using Right to Play materials, and learning about women in technology career fields. Activities and lessons addressing these learning areas align closely with Thailand's nationwide youth development goals. As they use Scratch 2.0 the students will be prepared to take part in developing an APP that follow the guidelines of Technovation. This APP will be created once students return to their respective sites and will be based on the needs of their own communities. In an effort to increase opportunities for young girls in the areas of Science, Technology, Engineering, and Mathematics (STEM), Girls Empowerment: Technology Project 2018 will reach beyond the confines of the one-time training. In addition to increasing the participating youths' knowledge across the aforementioned goal areas, the project will also increase counterpart and youth leadership capacity, provide necessary skills to support and sustain the project within the individual participating communities, and engage more host country entities in the planning and implementation of the project, allowing for ongoing engagement after completion of the camp itself with a community-based technology club. The community is truly the driving force behind this event. The teachers at the Primary School and government officers from the Primary Education Service Area Office 3 as well as other NGO's are very excited at the potential for increasing STEM education in the community. In this collaboration they will be providing their time as well as materials. In addition the teachers at the Primary School and the STEM professionals have spent months in planning for this event. In addition students and parents have shown an expressed interest in the event and it’s overall aim of increasing enthusiasm for STEM education among girls in the local community. Other communities have also expressed interest in this event and will be helping to recruit students who qualify to attend. The goal is to have sixy students from all over the Essan Region of Thailand in attendance. This is the second year for the Girls’ Empowerment Technology camp. The mission of the project is to introduce and continue to foster interest and creative projects using computer programming in a fun and creative environment that will push the students to think in a different way while working with peers. Group work will be a big component to this camp. The T4D committee will collect and distribute computer programming resources before and during the Girls’ Empowerment Technology camp. For those who are unable to attend, material shared during the camp will be made available via Google Drive. In addition, time will be allotted for professional development sessions during the Girls’ Empowerment Technology camp for the Thai counterparts. Public schools in Thailand have been encouraged to create more opportunities for students during the “teach less, learn more” hour at the end of the school day and PCVs have been asked to help provide activities during this educational hour. In addition, there has been more emphasis on STEM activities in the classroom to better prepare students for the 21st Century workforce. The Girls’ Empowerment Technology camp will provide training, resources, and a foundation for the formation of a technology club following the completion of the Girls’ Empowerment Technology camp and self-learning based on shared materials. Specifically, the resources that will be used in the project are free, available in Thai and English and part of an ever growing support community to encourage collaboration and shared learning experience. Scratch 2.0 actively promotes collaboration with others and has purposefully built an online platform for posting projects, a discussion forum and actively promotes new project-based programming challenges. This already established platform will allow for easy sharing and promoting of students’ work and expose the students to other project ideas and processes. It should also be noted that the Scratch software can be used and projects saved in an offline mode, without internet, and saved until the user can access the internet to upload their projects, if they so choose. T4D has also identified a Google sponsored Computer Science Club platform to provide a framework for post-camp activities.